Amazon.com description: Product Description: The starship Earthling, filled with thousands of hybernating colonists en route to a new world at Tau Ceti, is stranded beyond the solar system when the shipÃ¢â¬â¢s three Organic Mental CoresÃ¢â¬âdisembodied human brains that control the vesselÃ¢â¬â¢s functionsÃ¢â¬âgo insane. An emergency skeleton crew sees only one chance for survival: to create an artificial consciousness in the EarthlingÃ¢â¬â¢s primary computer, which could guide them to their destination . . . or could destroy the human race. Frank HerbertÃ¢â¬â¢s classic novel that begins the epic Pandora Sequence (written with Bill Ransom), which also includes The Jesus Incident, The Lazarus Effect, and The Ascension Factor. 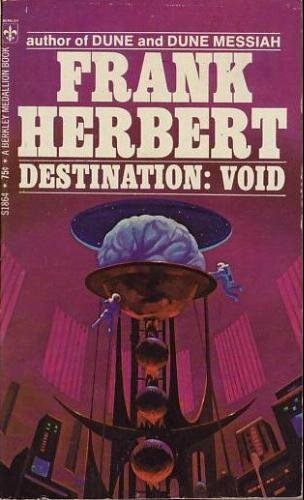 from Gregg Pr (April 1, 1981); titled "Destination, Void"
About: The starship Earthling, filled with thousands of hybernating colonists en route to a new world at Tau Ceti, is stranded beyond the solar system when the shipâ€™s three Organic Mental Coresâ€”disembodied human brains that control the vesselâ€™s functionsâ€”go insane. About: [Read by Scott Brick] (This is the Prequel to the 'Pandora Sequence' series) The starship Earthling, filled with thousands of hybernating colonists en route to a new world at Tau Ceti, is stranded beyond the solar system when the ship's three Organic Mental Cores - disembodied human brains that control the vessel's functions - go insane.